There aren't too many small breweries that produce lagers on a regular basis, let alone see them as a key part of their oeuvre. Yet they're close to the heart of Blackman's head brewer Renn Blackman. There's a fine lager as part of the brewery's core range and there have been others released along the way, sometimes as collaborations. Now, they've decided to make lagers the focus of a new series, one seemingly designed to show how many different directions you can head. 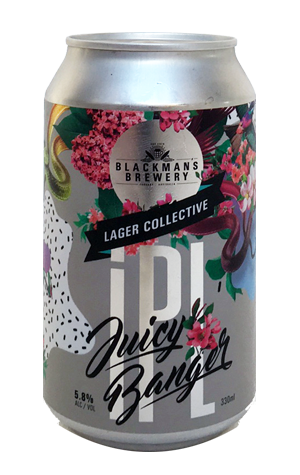 First of the three beers scheduled for release over six months is the Juicy Banger; it's an IPL, or India Pale Lager – in other words, a lager hopped to the levels you'd normally expect to find in an IPA. And you can see why they came up with the name Juicy Banger as the hops create big grapefruit and citrus aromas and flavours that dominate what's otherwise a clean and crisply bitter drop.